This past month my fitness routine consisted of five or six workout days per week using my Cathe Ripped with Hiit workouts and yoga dvd’s or routines from Yoga Journal magazine that I have saved. 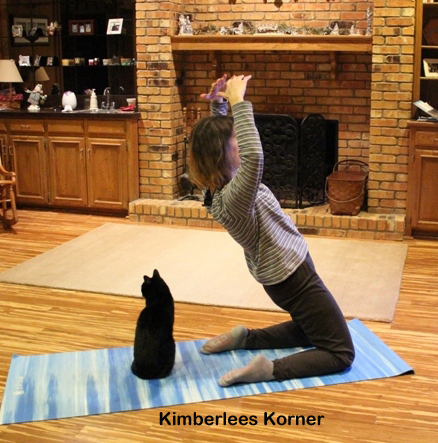 I have been alternating the two doing a Hiit workout one day and yoga the next. I have really been enjoying this schedule. 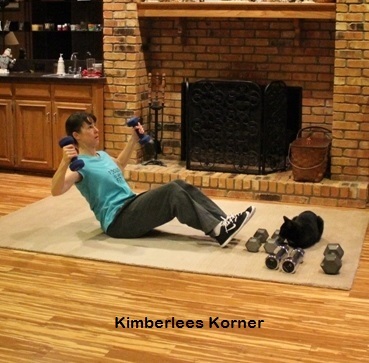 Scheduling your workouts is part of the key to getting them done, in my opinion. If I make a schedule up on Sunday, that is usually a non workout day for me, then I am going to commit myself to getting them done. “It’s not about having time, it’s about making time.” I have seen these words before somewhere and they are very true – everyone is busy these days – even my retired parents and in-laws always seem busy – but you have to make the time and make the commitment to yourself to be more physically active. I know that I always feel better and have more energy on days that I workout. Another thing I have been doing this past month is watching health documentaries – I know this sounds really boring but they are actually really informative about many things concerning the health of Americans and their diets and I find them interesting. Some of them can be found on Netflix and some I checked out from the library. The video in the photo above, Fed Up, is one I checked out from my local library. A friend of mine recommended it to me. This is a real eye opener about the food industry, how much sugar and artificial ingredients are really in those so called healthy foods you see at the store. 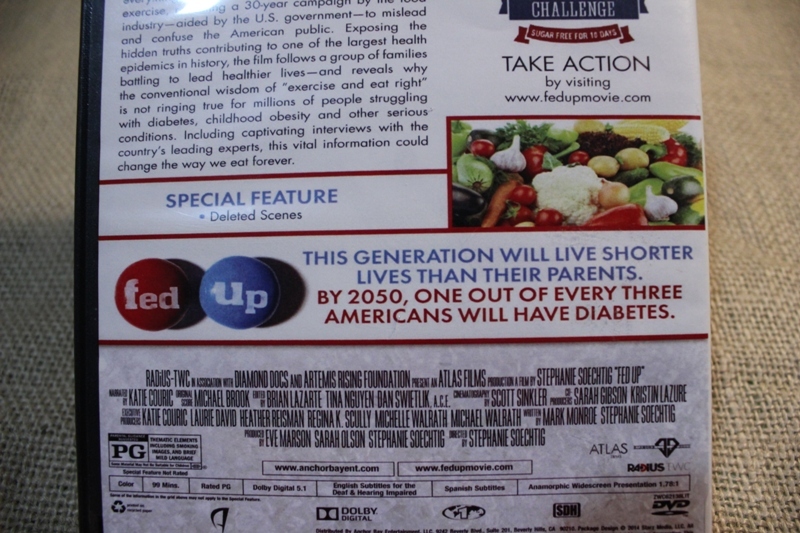 This documentary also goes into detail on the health of our children and how many are becoming diabetic at an early age due to poor eating and lifestyle habits. 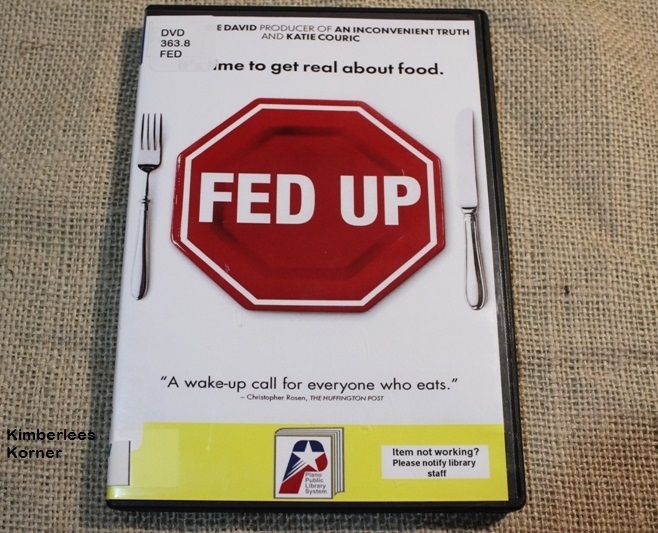 The other two documentaries that I thought were really informative were Hungry for Change and Fat Sick and Nearly Dead 2. Both of these are on Netflix. If you are wanting to learn more about eating better, juicing, and changing your lifestyle habits to become healthy, lose weight and get off prescriptions, I would advise you to watch these two documentaries. My overall health and eating is good but these documentaries oped my eyes to even more changes I need to make to how I eat and what I eat for it to make a positive impact in my daily life. 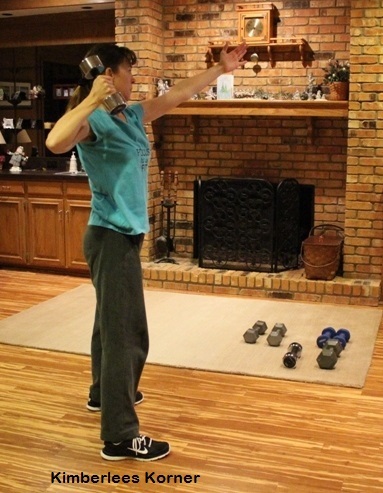 For the month of February am thinking of doing my P90X3 workout. I am not going to do the whole three month program again like last year, I am just going to use it mixed with some other workouts for the month of February. I have been doing my Ripped with Hiit and yoga for over a month now so it is time for a change. If I change things up then I don’t get bored – that is another key to making your workouts fun, challenging and keeping you interested in sticking with it. Also, I believe it is a key to seeing results because your body needs a change. So check back at the end of February for my end of month (EOM) fitness update – of course you can also check back sooner as I will be sharing other posts before the end of February on various things. Have a great Superbowl weekend! A year or so ago I learned of a new berry called goji berries. Apparently they are poplular in Chinese medicine and considered to be a fruit of longevity. These little dried berries are a real superfood that can aid the immune system. The little bright red dried berries – pictured in the photo above – can be eaten by themselves, kind of like dried cranberries, or you can add them to other foods like a smoothie. 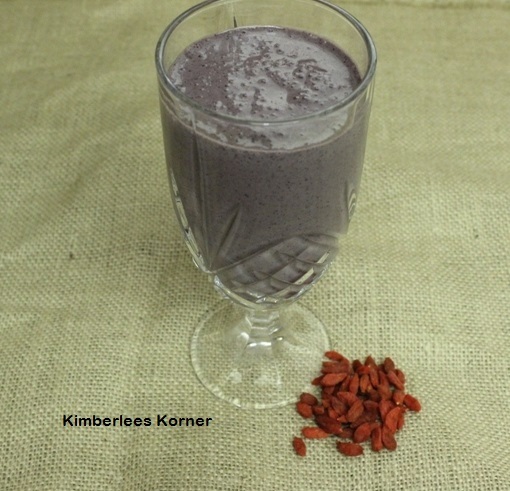 That is how I prefer to have my goji berries – in a refreshing fruit smoothie. The other superfood ingredient I have recently rediscovered and am using in my smoothies is chia seed gel. Chia seed gel is really simple to make. 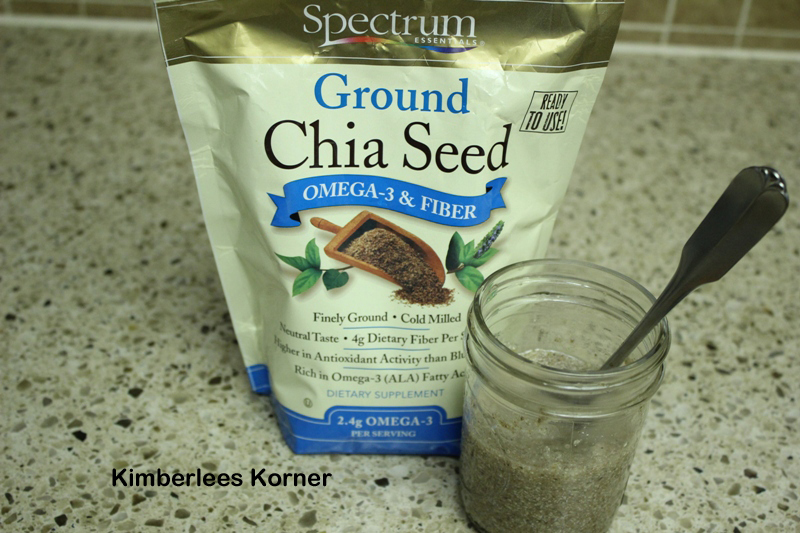 To make the gel you take about 2 Tbls of chia seeds or I use Spectrums ground chia seeds and then add about 3/4 to 1 cup of filtered water and stir, allow it to sit for 20 to 30 minutes and stir again – it should be a gel. I put mine in a mason jar and label it and date it – I usually use it within a week in my smoothies or even yogurt or oatmeal. 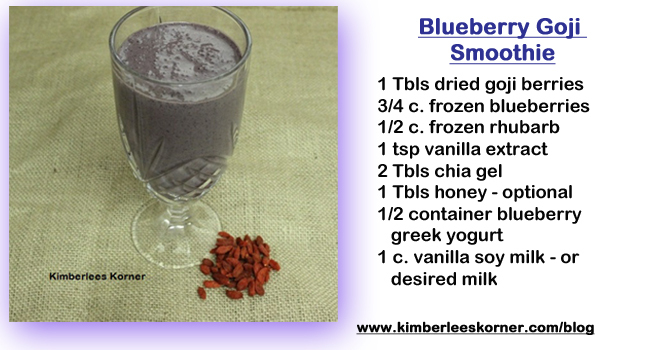 I like adding this gel to my smoothies to thicken them a little and to provide extra fiber and antioxidants plus omega-3’s. Today I am going to share a couple of my recent smoothie creations using goji berries and chia gel. To make these smoothies it is best to have a high speed, good quality blender, like a Ninja blender which is what I use. The first one is Blueberry Goji – this one is super healthy with the blueberries and rhubarb plus the goji berries and the chia gel. This is great for breakfast or for a snack. 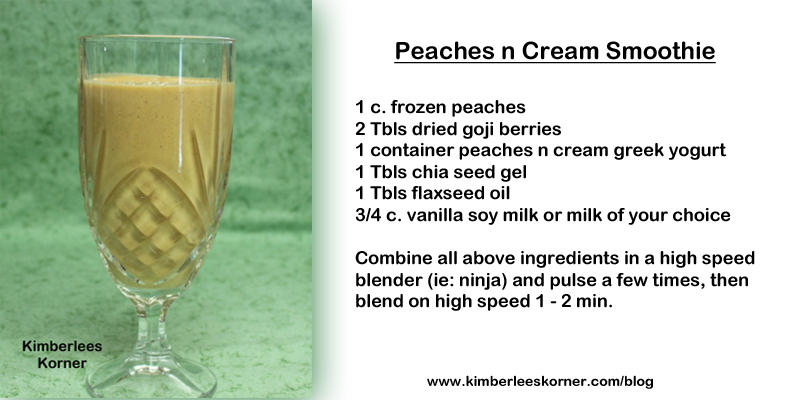 The other smoothie I recently made and love the taste of is Peaches n Cream Smoothie. This one is also great for breakfast or a snack – the frozen peaches make it really creamy along with the peaches n cream greek yogurt. What kinds of smoothies do you like to make? Let me know in the comments – I am always looking for new smoothies to try. 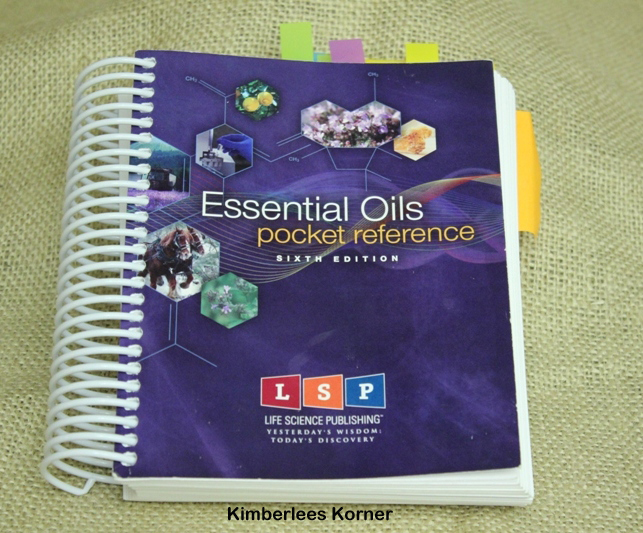 Essential oil books are great to refer to when you get into using essential oils. There are several essential oil books that I refer to and use on a regular basis. I find myself referring to these books and continuing to learn more about different oils all of the time. 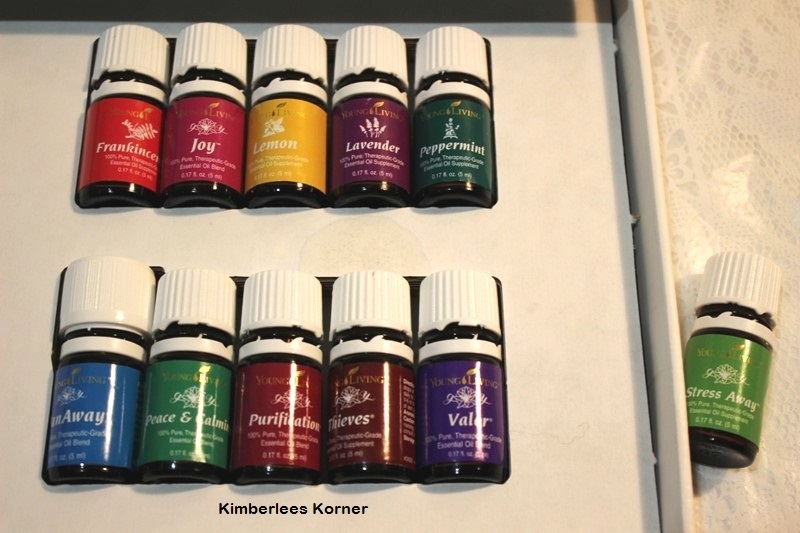 Chapter 5 – Essential Oil Blends – This describes how Young Living blends are formulated then lists each blend alphabetically and the same info I just listed above for the singles such as use and applications, etc. Chapter 7 – Personal Usage – This is a great reference chapter on giving you info on taking charge of your health, developing your program and a complete reference guide for many common health issues like: arthritis, colds, flu, headaches, insomnia, pain, skin care and problems, sore throats, and stress – just to name a few common ailments. I love this chapter and refer to it all the time just to learn more about certain health aspects. 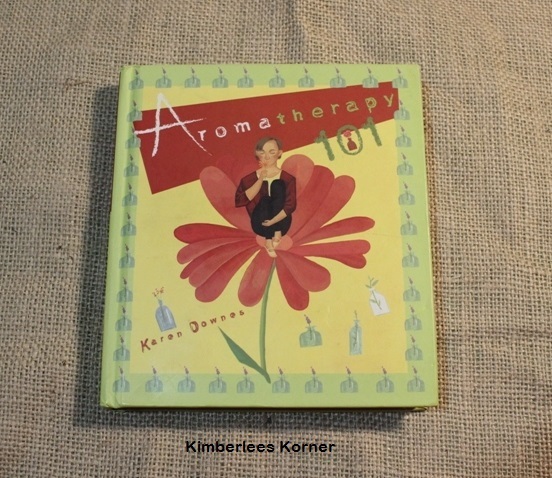 Another book I refer to a lot lately is Aromatherapy 101 by Karen Downes. I have owned this book for over 10 years. I bought it back in early 2000 when I first got into using essential oils. I like this book because it explains what aromatherapy is, what essential oils are and gives you info on how to properly use them. The book also lists the oils alphabetically. She gives you a great description of each oil, the issues it addresses, what it helps promote and any safety information. Lately I have been reading this book a lot again and referring to it along with the pocket reference. I also like how in the Aromatherapy 101 book she recommends oils that blend well together. Even though this book is older, published in 2000, I still see it around on the internet and I think it contains some really good and helpful information for anyone learning to get more from their essential oils. If you are interested in learning more about Young Living essential oils you can email me kkg@kimberleeskorner.com Also, if you are interested in signing up for Young Living you can click on the highlighted Young Living to take you to the sign up page. You can sign up for a retail account but if you sign up for a wholesale account, or distributor, you will save 24% on all your orders. There are not a whole lot of rules and requirements to be a wholesaler – you have to order a starter kit is the main one. After that you can order as much as you want or never again. If you decide you love Young Living like me then you can sign up for Essential Rewards that is a monthly auto ship where you decide what you want in your order each month and it has to be a minimum amount of $50.00. Also, if you decide to sign up I will send you a copy of the Essential OIls Pocket Reference – that is the first book I mentioned above in the post. 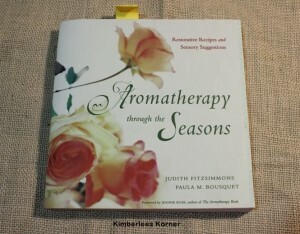 One of the books I will be reviewing in Part 2 of this series will be Aromatherapy Through the Seasons. This is another book I have had since the early 2000’s. So follow my blog or check back for part 2 on essential oil books coming in February. I will also be sharing some recipes for foods and skincare using essential oils in the future. This sweater is a recently finished knitting design of mine. I have designed many cowls, scarves and shawls and decided to give sweaters a try. This is not the first time I have knit a sweater but it is the first time I have actually designed a sweater with my own idea. It was a lot of fun and I love the way it turned out. I have already wore it several times. The idea for this sweater began first with the variegated yarn which is Red Heart Soft. I then found a pretty ripple scallop sytle stitch to use for the lower edge and the ends of the sleeves using this yarn. 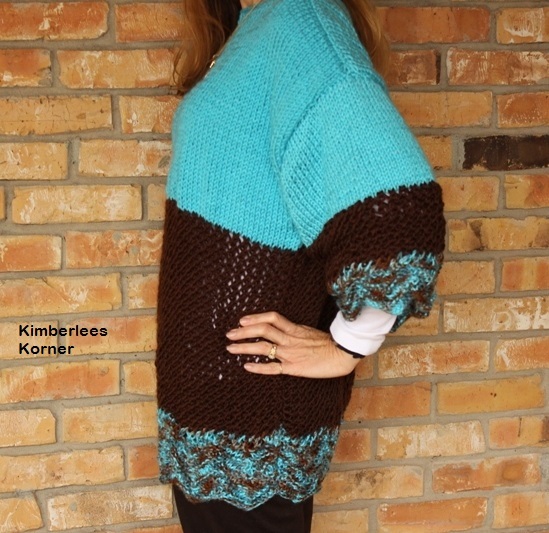 For the middle section I chose a lace, openwork, stitch and switched to a solid color yarn to bring out one of the colors in the variegated yarn – this part is the brown. I also knew I had made some brown leggings last winter and that they would match perfectly. 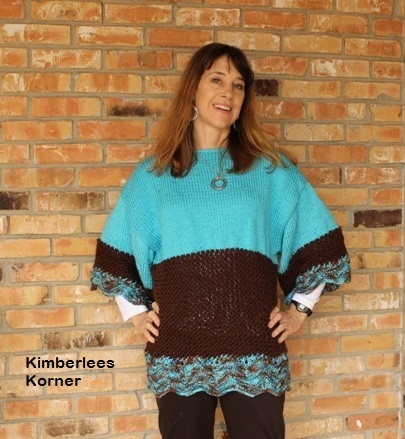 The top part of the sweater and the top of the sleeves are knit in another stitch – the stockinette stitch – and I switched to the turquoise color yarn for this part to bring out the turquoise blue in the variegated yarn. I really enjoyed using my creative ideas to knit this sweater. 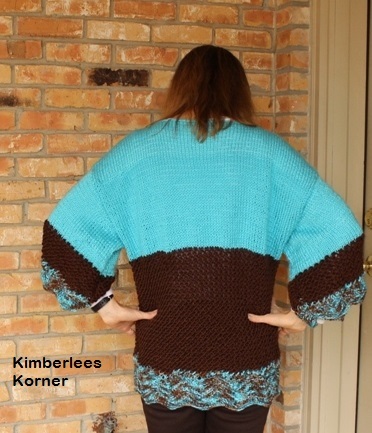 I am currently taking a class on craftsy to learn sweater designing techniques. Hopefully I will be able to offer this pattern in multiple sizes – currently I have it written for a small to medium size and it will be available soon on craftsy and in my etsy shop. 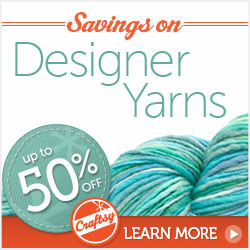 Craftsy is a wonderful place to take online courses to learn new skills. I have taken many of their knitting and sewing classes and have always learned a lot from them. 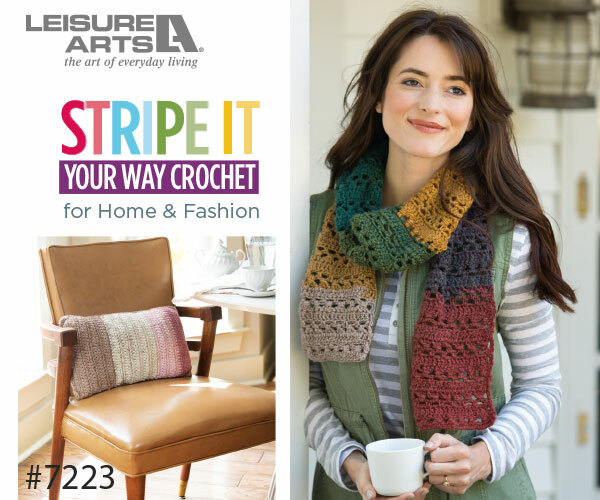 Below is an affiliate link to take you to craftsy if you are interested in checking out any of their knitting classes. 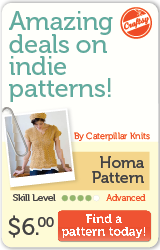 They have classes for beginners as well as advanced knitters. This weekend, January 17 and 18, 2015, many of their classes will be half off – this is a great time to give a craftsy class a try or to stock up on classes you have on your wish list. Essential oils seem to be everywhere lately. I first learned about essential oils over ten years ago. 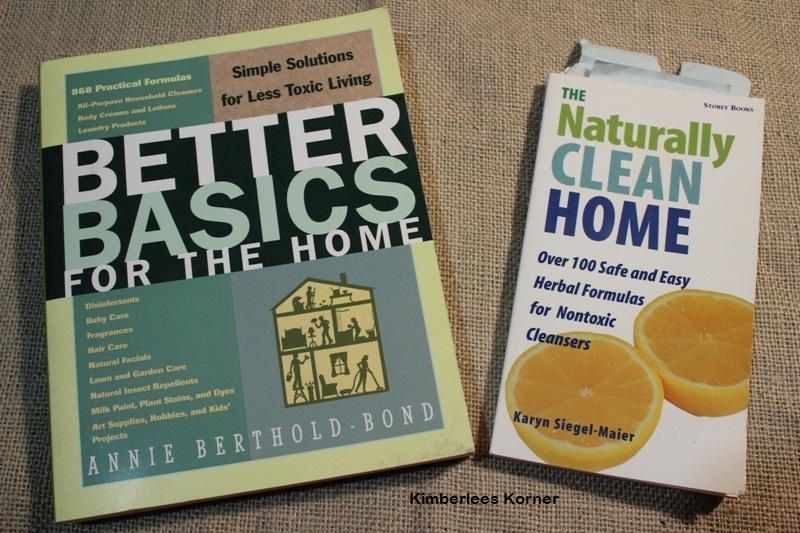 I was learning how to make my own cleaning products and found that essential oils are used in many of the cleaning recipes in some books I purchased back in early 2000. I still have and use the books and they are still available today. Recently I have learned about Young Living essential oils. I kept finding information about them on pinterest and I also read about them in my fitness group on facebook from someone who was using Thieves oil for illness with her kids. Then, I remembered that a friend of mine was selling them so I contacted her to learn more and how to get them. After talking to my friend I learned that Young Living is a company that only sells the oils to “members”. You can buy at a “retail” level but you pay more money. To get a better price you have to join and be considered a “distributor” to get the wholesale price. Also, when you join at the distributor level you are required to buy a kit for your first purchase. Well, after learning those facts I was kind of apprehensive about “joining” their company and being part of something I may or may not like. I talked to my friend some more and she assured me I would love the oils, since I already knew so much about essential oils, and that the Young Living oils were very high quality. She also told me there was not a catch to joining that if I bought a kit and decided I didn’t want anything else ever again I would not be obligated to order monthly or ever again for that matter. The only way you are obligated to maintain a monthly order is if you join their ER – Essential Rewards – program that is optional on your part. So, I did more research on Young Living – found even more great info on pinterest and decided back in November to join and ordered the Everyday Oils kit that also comes with a diffuser and a few samples. The oils that come in that kit are the 5ml bottles and I have already used most of them up in the past six weeks. I am in love with these oils and use at least two or more daily for the past six weeks. I like the fact that so many of their oils are therapeutic grade and can be ingested. The essential oils I have used in the past could only be used topically or in my cleaning recipes. I also notice the Young Living oils smell much stronger and have a lot more staying power – the scent does not fade off quickly. The Young Living oils have also helped me and my family with some recent health issues. I think that when used properly essential oils can offer some alternative therapy for many common ailments. In addition to making my own cleaning products, which I have done for years – I am now making my own face and body care with these oils. Some of the things I have made are recipes I have found and tried from pinterest and others are a combination I have created using books I have and my own personal preferences. I am trying to be more chemical free and use less toxic ingredients on my skin. I am now making and using my own face wash, face toner, moisturizer, body butter and deodorant. I will be sharing my recipes and more info on these in future posts on my blog. If you are interested in joining Young Living you can click on the highlighted text to take you to the sign up page on the Young Living site. You can also message me via email at kkg@kimberleeskorner.com for more info if you have any questions.